If you haven’t ventured over to REI’s social accounts lately, you should. Something amazing is happening. For years, we’ve been told that silos between customer service and marketing are just facts of life–something to expect. Yet, REI’s customer service replies look like, feel like, and even using the same language as their other posts. It’s common knowledge at the enterprise level that silos wreak havoc. But how to fix the problem? REI breaks theirs down through social, a channel more visible and real-time than any other. Social should be your brand’s first responder: available to support your customers whenever they want to reach out. On the flipside, creating alignment can pay dividends. Customers enjoy a better and more consistent experience, and brands gain more control of the customer journey. 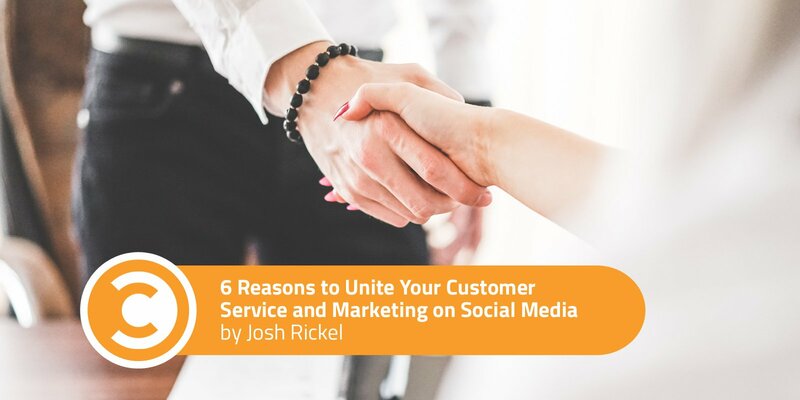 Let’s explore six great benefits businesses reap when service and marketing unify on social. REI recently dedicated the remainder of 2017 to promoting gender equality in the great outdoors. 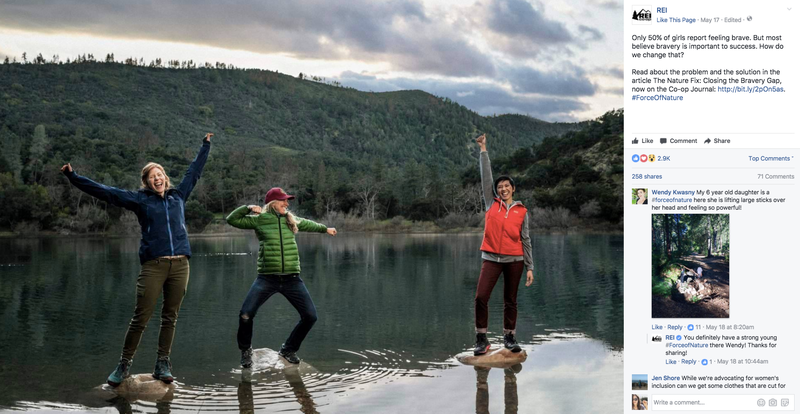 The effort is called Force Of Nature: It tells the stories of women outdoors, features female-oriented adventure gear, and of course, boasts a hashtag. So when REI’s marketing team publishes a post on the latest women’s rock climbing gear (which was finally brought up to the same standards men have enjoyed), the folks replying are right there with them. For a brand to live its values—that is, on its public social channels—marketing and support must be united. 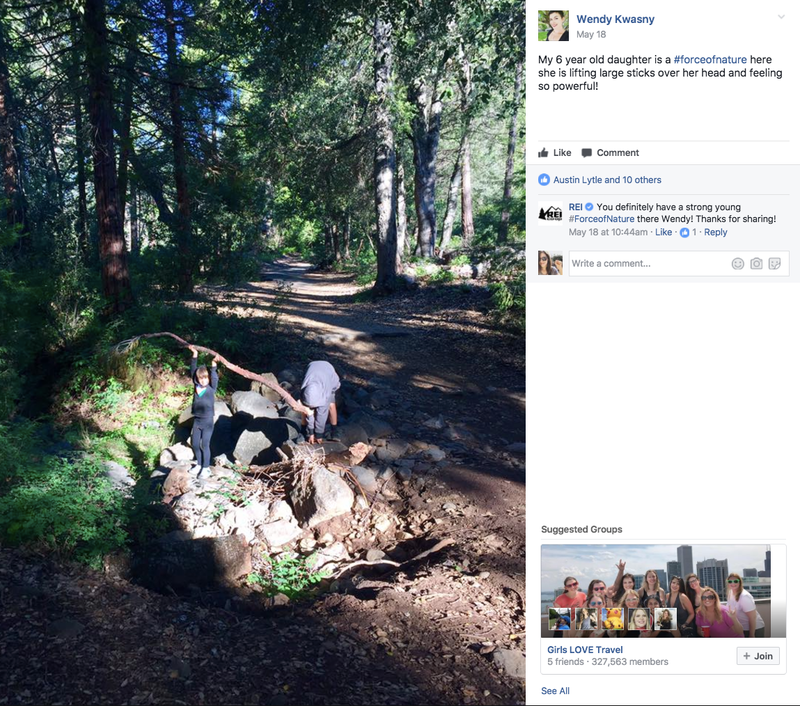 REI’s marketing team spearheaded the #forceofnature campaign, but it was Support who spotted and responded to this fan’s touching photo. Marketing owns the voice of the company, while service owns that voice’s support. Both are well-versed in talking to customers and prospects. It’s marketing’s job to ensure what they say to customers matches how service is responding. When REI’s support team uses marketing’s #forceofnature hashtag, they reinforce marketing’s message and unify the brand’s voice. I recently purchased a GMC. After the enthusiastic, smiling, and incredibly friendly salesperson handed me the keys, I was back just a day or so later for some follow-up services. And what do you know? An equally enthusiastic, smiling, and incredibly friendly service person was there to greet me right when I pulled in. Car dealers learned a long time ago that offering an excellent customer experience anywhere the customer interacts with their brand is not only a differentiator but something they can use in marketing. Brands should take this same approach on social: No matter how a customer wants to interact with a brand, they should expect a cohesive experience. 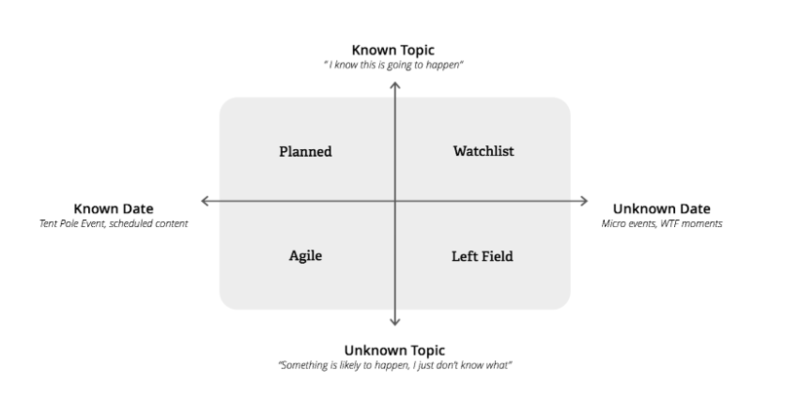 Spredfast’s vice president of Research and Insights, Chris Kerns, created one of my favorite quadrants ever. It describes various scenarios marketers might encounter on social and was originally designed to help brands understand real-time marketing. But, with a bit of rewording, it works perfectly to help brands get service and marketing on the same page when it comes to the type of scenarios they may encounter with their marketing content. Planned messages: These are scheduled social posts your brand plans well ahead of time. These are the messages you control and can include anything from daily engagement to huge product announcements. Agile messages: These are opportunities that may arise or problems that pop up during events known well in advance. For example, the Oscars botching the best picture announcement and your brand deciding to make a post about it. Watchlist messages: These are known topics that could bring about a totally unanticipated headache. Example: The President of the United States decides to tweet about your pending military contract. Left-field messages: These are things you know nothing about that flare up on a semi-regular basis. Wendy’s could not have predicted that their response of “18 million” to a kid who asked how many retweets it would take to get chicken nuggets free for a year would turn into the hashtag #nuggsforcarter (and become the most retweeted tweet of all time). In every quadrant, coordination between marketing and customer support makes the brand’s overall response smarter. Giving visibility to the support team on the upcoming editorial calendar pays dividends: Teams can plan resources, write FAQs, and pre-approve response language more effectively. Marketing keeps support up-to-speed on upcoming posts and big brand events, both internal and external. Both teams win big. When the service and marketing teams have a united view of their audience, everyone wins. The marketing team gains valuable information about the people who are contacting the brand and for what purpose, helping to identify influencers and better segment their audiences. The support team has a full interaction history, meaning they don’t need to dig around or ask the customer for information they have already given in previous interactions. The customer receives a personalized experience tailored to their particular location, status, and personal preference. Brands use social data to inform product decisions and trigger PR responses on the marketing side. The most advanced companies also include information gathered via social support channels into their day-to-day decisions—like influencing the type of products that need to be on the shelves, tracking the most commonly reported issues on a product, or helping R&D make decisions on product direction. Social care data can help with triggering recalls, informing press releases, and understanding if the brand has “permission” to lean in on an inevitable controversy—or should stay far away. The marketing team understands the macro trends on social. The support team can spot potential PR threats early and use that information to prepare for a crisis. The customer support team can, well, “support” its marketing team, too. The support team can help the marketing team understand when a brand wants to lean into a conversation, or even what messaging is working best. “Technology to the rescue!” says the technology marketer. But it’s true. It’s the origin of why we (Spredfast) exist. Facebook, Twitter, and others have made it easy for someone to reach out to your brand, publicly and privately. But brands historically lack a unified interface or controls for the tens, even hundreds, of people who work for the brand that needs access to those channels. It’s technology, specifically Spredfast, that allows for teams across the company to control company social accounts. Spredfast provides a holistic picture of customers on social, keeping track of history and influence. Spredfast also provides visibility into planned content, collaboration among teams via chat, workflows between groups, and enables shared asset libraries. But establishing an integrated social strategy is only half the battle. Marketing and support teams must unify on the technology platform that drives this strategy. It’s what makes all of the benefits possible, ensuring your company’s values truly come across to customers no matter where they interact with your brand. With two cooks in the kitchen, you might ask, “Who will do what?” If marketing and support are together on social, it must be clear who will address which types of interactions, on which channels, and to what extent. Typically, in a “best of both worlds” scenario, the marketing team owns proactive messages, focusing on brand awareness, lead generation, conversion, and driving positive mentions of their brand. The support team will react, handling questions, problems, and complaints. Basically, if the content is negative or requires some action from the business, it likely belongs to the support team. Put yourself in the shoes of your customers. How can you improve the way your business communicates with people? Customer interactions on social offer brands too valuable of an opportunity to not get right. Forrester offers great advice on how you can be using social to bridge the gap between marketing and customer service. Editor’s Note: This post is part of a paid partnership between Convince & Convert and Spredfast. To find out more about how Spredfast can help you tackle the divide between support and marketing at your enterprise, request a demo today. Josh is the VP of Product Marketing at Spredfast. He and his team help identify and understand growing market trends and challenges in order to inform product strategy and broadly communicate how Spredfast connects the world’s businesses to the people they care about most.